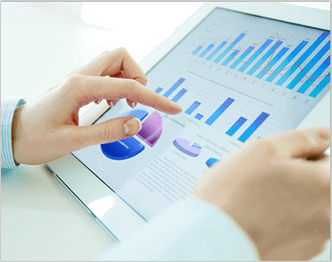 Elite Site Optimizer (ESO) is an innovative SEO analysis tool which ensures maximum website optimization. 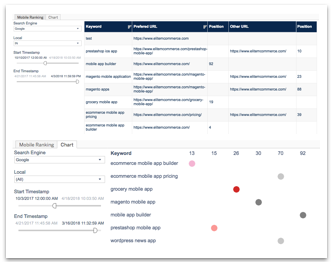 This SEO analysis tool focuses on mobile ranking analysis and keyword ranking analysis, making it easy for the users to enhance the performance of their sites. Also, this ESO allows SEO professionals to keep a check on their domain performance in various search engines.ESO gives SEO professionals with analysis and reports of different kinds like rank analysis, competitor rank analysis, page-wise rank analysis, mobile rank analysis, site audit report, on page SEO elements report, missed opportunities report, link checker analysis, different analytics, social signal tracking and more. ESO’s Site explorer reviews all pages of the domain and generates a report for any on-page optimization issues on the website such as pages with no title tags, pages with no description tags, pages with no canonical attribute, missing H1 tags, images with no ALT tags, domain speed, and performance information. The Site Explorer enables to exports On -Page SEO Elements for all pages in the selected domain using different filters as ‘On Page SEO Element Extractor’ feature. The web agencies/ SEO professionals can make use of this SEO and Mobile ranking analysis feature to keep a track of their domain’s performance in different search engines, different mobile platforms and get ranking data such as comparative ranking, ranking for URL combinations for any given keywords and page-wise rank data. The Social signal tracking feature provides data about the Domain’s interactions and activities with popular social media websites like Facebook, Twitter, LinkedIn, and YouTube. 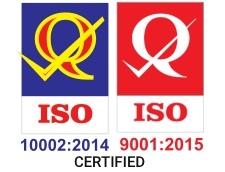 ESO integrates with the Google webmaster account and Analytics account in order to provide significant data such as Search queries report, Top performing pages, Domain traffic data by preferred landing pages, by social networks and by search engines. 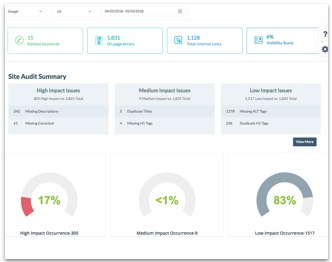 Based on the analysis of Google Webmaster data and other data analysis, ESO offers a report as Top action items that require immediate action by the webmaster. 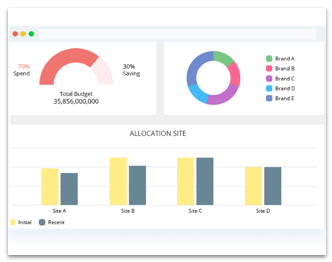 The Top Action Items are listed and categorized as high, medium, and low, based on the priority. This feature helps site owners based on both branded and non-branded keywords search results. 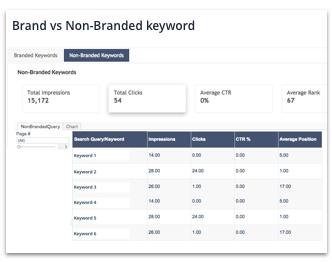 A “Branded keyword” usually includes the brand name, whereas the “Non-Branded keyword” is a general keyword that does not contain the target websites or brand names. 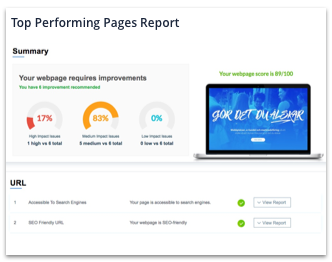 The ESO’s Top Performing Page feature provides data about the top performing pages of the domain. 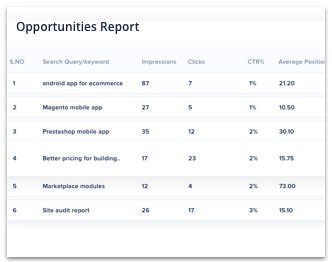 It also provides page report including Page wise Impressions, Click through rates (CTR), Average Position. Using this report the Domain owner has an insight of best-performing pages, thus drawing their attention to other pages to increase their domain visibility. This is a unique feature in ESO that enables the owner to find out about the missed traffic. 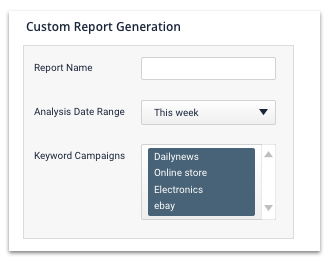 A report is generated to provide missed opportunities of user visits based on specified keywords. This is a major feature that allows the user to add multiple domains and sub-users for an account. 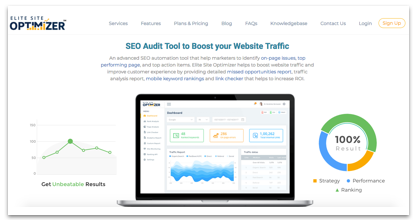 It is more beneficial for enterprise businesses or agencies that require a single SEO professional to manage multiple sites.